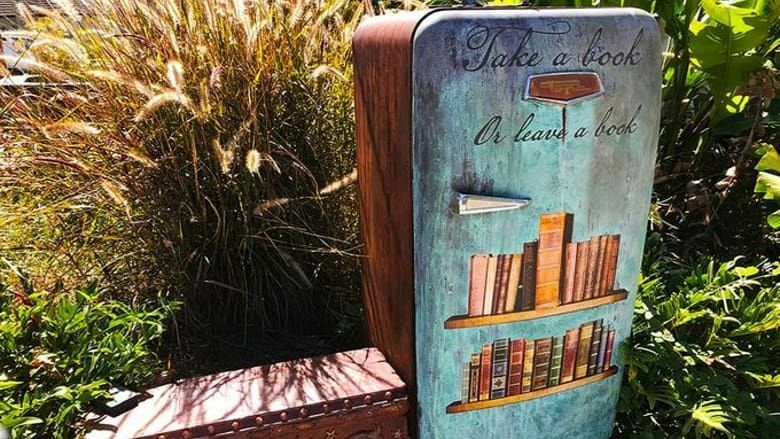 There's a quirky new reading revolution that is quietly spreading across Brisbane (and the world) - pop-up Street Libraries. These miniature community libraries are an initiative of residents and sometimes businesses across the inner-city and suburbs of Brisbane, and can take the form of everything from purpose-built garden huts down to phone boxes, recycled fridges and repurposed letterboxes. The idea, based on the old honesty box system, is the Street Library owner fills the box with books (of any kind of genre) that anyone can come along and borrow for free, swap a book or donate a preloved book of their own. The architect owner of this West End Queenslander designed a matching library for his front garden. The primary school teacher who set up this little 'book hive' was inspired by her backyard beehive. An old phone box has been converted into a book cabinet out front of The Red Queen Design vintage store on Latrobe Terrace. In the back streets of this bayside suburb is a book shed that stocks books, DVDs and kids games. Found outside The Letter Lounge literary café in Red Hill is this colourful little bookshelf-on-wheels. Attached to the white picket fence out front of an Ashgrove home is this letter box-turned library. Near the bus stop on the corner of Jubilee Terrace and Fletcher Parade Ashgrove is a retro fridge library with seat. Note that this one is not listed on the Street Library website. Nice to know - Not only is the Street Library a great way to recycle books, but also for children and families to discover new books without the cost, meet neighbours and even make new friends in the community.